5 Nov. – 31 March End 5:00 p.m.
5 Nov. – 31 March 2:40 p.m.
Wollen Sie Berlin ganz individuell erkunden? Dann ist die Best of Berlin Tour by City Circle von BEX Sightseeing mit den gelben Cabrio-Doppeldecker-Bussen genau das Richtige. Sie entscheiden selbst, wie lange die Stadtrundfahrt dauert und wann und wo und wie oft Sie aussteigen und wieder einsteigen möchten. The Best of Berlin Tour by City Circle is the most individual and eventful Berlin city tour. 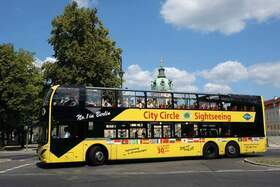 You are free to decide when and where to hop on and off the coach, because the bright yellow open-top coaches serve 18 different hop-on hop-off points in the vicinity of Berlin´s main attractions every 10 minutes. This gives you time to discover the innumerable sights of Berlin on your own. Of course, you may also remain seated and enjoy the city tour during a tour of 2 hours and 15 minutes: the choice is yours.